Just like a mother doesn't care who is looking at her nakedness while she's giving birth to a baby, you must be willing to open up, let go, not care what people think as you are pursuing your dream. You may look foolish to some people who are making fun of you or complaining that you keep promoting your business on social media, but if that is what is going to make you successful, keep at it. I have a friend who ceaselessly promotes her business on Facebook and was given a side eye by some but she has become a success because she did what she had to do. I don't see any problems with bloggers commenting on your blog and asking you to check them out and follow them. I have found so many great blogs this way. If these bloggers didn't ask me to check them out, I wouldn't have found them. I remember ordering an Avon sticker for my car and was afraid to put it on my car for a whole year because of the fear of looking foolish especially at work; fearing what my co workers and boss would say. Well, I finally put it on and the so called co workers and boss are my customers. Doing what I can with the project I'm working on even if I don't have 100% experience. Gotta start somewhere right? 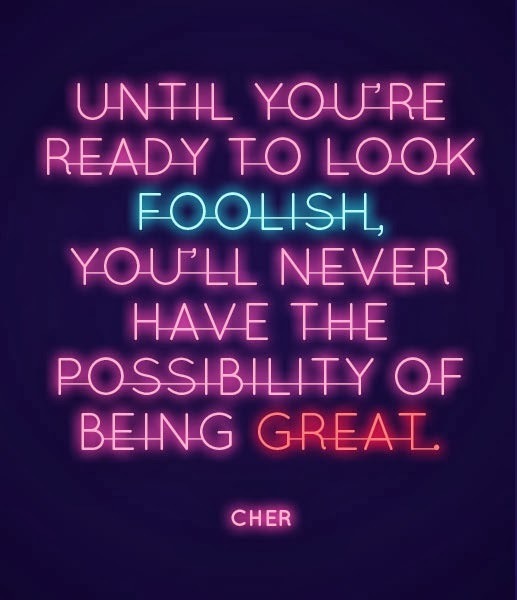 In what ways are you ready to look foolish? Also, I think we have a similar body type, so I look forward to seeing more outfit photos on your blog - you look great! This is great! I always worry that people are like "what the heck is she doing..." when I take pictures for my blog or even just for my personal use. No more no more! I love this! I'm new to blogging so I find myself too worried about other people's opinion on what I'm doing. Thank you for sharing this message! I think it's something I needed to hear too!